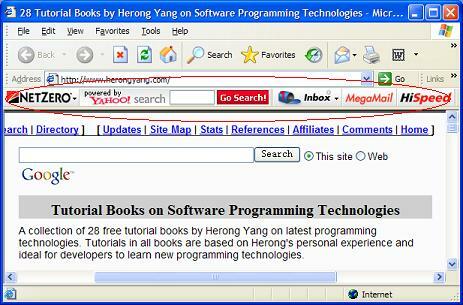 This section provides a tutorial example on how to remove NetZero toolbar - Toolbar.dll. NetZero toolbar offers you a search box and icons for NetZero related services. However, it does take away space from your browser window to make a "bar" to displays icons for you to invoke its functions. I want to remove it. Quick Research: I did a Google search with "NetZero Toolbar" and got a few good matches. None of them report any malicious behaviors. What I Did: Looked at IE > Tools > Internet Options > Programs > Manage Addon, and disabled "ZeroBar". Result: NetZero Toolbar is gone!